Back in December, I wrote a post about BabbaBox. A BabbaBox is basically a themed package of entertainment for your kids that is delivered to your door. My boys loved getting their Babbabox in the mail and couldn’t wait to start the activities. Last time, we made a really cool moon night light that actually ended up on display in my bedroom. When I heard BabbaCo had re-designed the BabbaBox, I jumped at the chance to preview the new look. Honestly, I wasn’t sure what they would do to make it better. What I liked most about the new presentation was that it wasn’t actually in a big box. The packaging, which my sons ripped into before I could take a picture, was more compact. I liked that I didn’t have excess material to throw away or recycle. 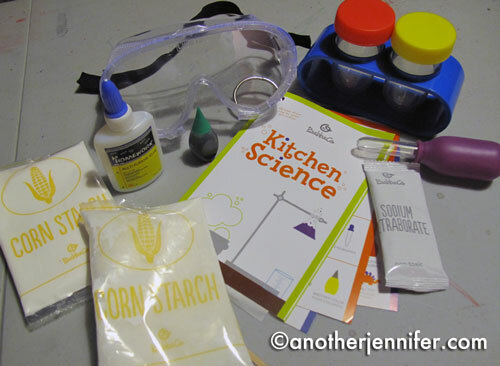 The contents had a kitchen science theme to it. It came with safety goggles, test tubes, an eye dropper, stirrers, food coloring and various ingredients to help us with our experiments. The contents of our BabbaBox. My boys got to be chemists. G took the lead and read the easy to follow directions for our projects. There were also some fun questions along the way that helped the boys understand the science behind what we were doing. G and Biz playing with the magic mud they made. The “mud” was both solid and liquid at the same time! We made a lava lamp. Biz and G looking at what happens when you add food coloring to water and oil. The one with the oil make a lava lamp! We even made a volacano! As you can see, Biz really like making the volcano erupt with hot lava. The suggestion to add dinosaurs was a good effect. The best part about this particular BabbaBox is that my boys are already thinking about other experiments they can do. G immediately put corn starch on the grocery list so that we can make magic mud again in the future. Unlike the last BabbaBox, I know that I will get even more activities out of it. I can’t wait to see what they come up with next. You can get BabbaBox delivered to your door via a membership. It’s pretty affordable too. And I even have a BabbaBox coupon code for you to use: BABBACO10. This code gets you $10 off a new monthly or annual membership. So, yes, we were blinded by science. 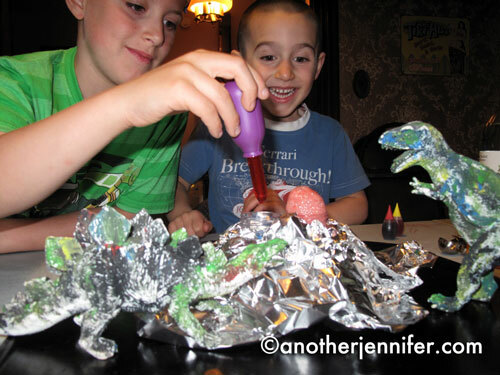 Have you ever done science experiments with your kids? I was given a free BabbaBox in exchange for this post. The opinions and text are all mine. 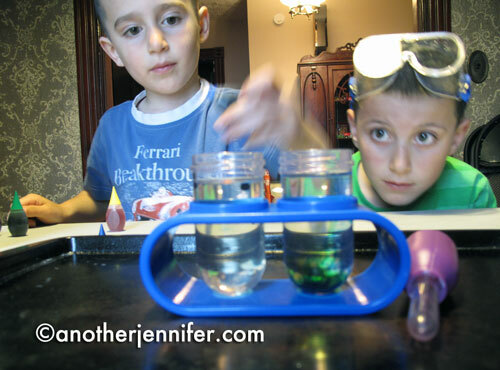 My youngest used to love experiments! What fun something like that would have been when he was younger. Projects like those can instill a lifelong interest in learning about science! Exactly! 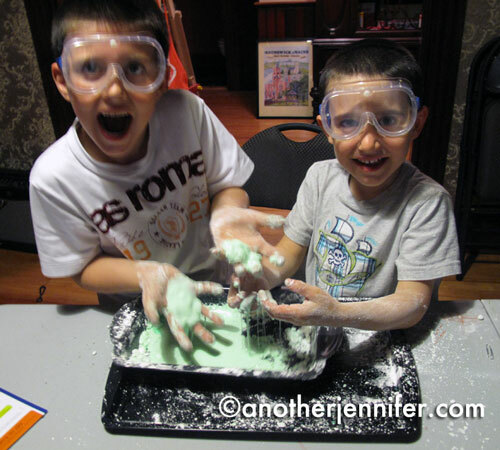 My boys loved getting their hands dirty – literally! – and doing the experiments. It made them think, which I loved. thedoseofreality recently posted..“Arie” Ready To Find Out The Big Winner?! Could be a great wait to entertain the kids during summer vaca, Ashley! Ooh this looks really cool! I am waiting just a little bit longer to do science experiments of this nature. Right now painting is a big enough experiment for my 3 little ones! But I love the idea of all the materials coming in one box, cause I am terrible at coming up with ideas and gathering all the materials! It might be a bit mess with little ones. Maybe an outdoor project! The fact that most everything was in the box – we needed to get a few things like a cake pan and vegetable oil from around the house – was perfect. I come up with ideas but then get lazy about putting it all together! I had just as much fun as them, Cyndi. I can’t wait to make the bouncy ball! This is so awesome! I think I’d have a blast doing this, much less my daughter. I think I’ll have to order this! Fun for moms and kids. Win-win! Oh those pictures are SO adorable!!! What a great idea and so much fun for the kids!!!! I will need to definitely look into this… SO cool!!!! Love BabbaBox. So do the boys, as you can see! I love this idea and I love that it has a science theme. I’ve seen the craft boxes and they are not for me! But science has potential – especially on rainy summer days! I’m artistic, but I’m not crafty. If it has too many steps, I get frustrated. This was perfect and G could pretty much do everything himself (though Biz and I had fun too!). With summer starting and the kids out of school this would be a great way to keep them educated and entertained during the summer, I’ll check them out! ❤ Julie Maloney ❤ (@Momspective) recently posted..My Backyard Transformation – Check Out My Pool! Absolutely, Julie. They have a different theme every month. Very cool! so totally unrelated, but Ihad to laugh whenI looked at Mama Kat’s prompts for the week and one of them is to write an entire post inspired by the word bacon! totally for you! Wait. I’m not seeing this. Is it a writing or a vlogging prompt? I’ve been neglecting the vlogging lately, but I’m hoping to do more soon. I probably already have something to link up! My pleasure, Krystal. My boys have loved both BabbaBoxes we’ve received.